Aurora is proud to announce that the bathroom facilities in Funkia, Goderich have finally been opened up for the public. The whole community was in a festive mood this morning when officials and other important people visited the community to participate in the opening ceremony. Several emotional and inspirational speeches were held by various stakeholders and it is the hope of all who participated that this is just the start of a long and fruitful cooperation between Aurora, Neptune and the people of Funkia, Goderich. 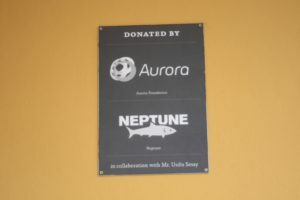 Aurora has been working for the past year in Goderich through its fishing project Neptune. The building of toilets, showers and sewages in the neighbourhood surrounding the fish landing site, is part of the social responsibility policy of Neptune.